Gutes Wissen und Zusammenarbeit fördert die Coworking Community. Unterstütze das neue Deskmag! Deskmag ist das meistgelesene Magazin der Coworking Bewegung. Seit mehr als drei Jahren teilen wir weltweit Geschichten, Statistiken und Wissen über Coworking. In dieser Zeit erreichten wir knapp eine Million Besucher, die der Entwicklung dieses kreativen und unabhängigen Arbeitsstils folgten. Jetzt benötigen wir eure Unterstützung, um unsere Arbeit zu verbessern und euch weiterhin regelmäßig über die Welt des Coworking informieren zu können. Wir möchten Deskmag aufbohren und in eine kollaborativere Plattform umbauen, mit mehr Stories und Stats über die Coworking Bewegung. Jede Spende fließt direkt in das Projekt und unterstützt die weltweite Coworking Befragung, den Coworking Markt Report, die Coworking Bibliothek und neue Tools für die erweiterte Website! Magst du Coworking? Wir tun es auch. Unterstütze Deskmag! Ob klein oder groß, wir schätzen jeden Beitrag. Deskmag schreibt über Coworking von allen Seiten. Wir arbeiten in Coworking Spaces und sprechen direkt mit Betreibern und Mitglieder von Coworking Spaces. Wir veröffentlichen fast ausschließlich originale Arbeiten in unseren Artikeln, von Interviews bis Statistiken, abseits von Mainstream-Medien und Nachrichtenagenturen. Direkt von der Quelle. An example of our in-depth statistical research is our Annual Global Coworking Survey. Since 2010, we have conducted three studies, and are busy preparing our 4th. Last year, more than 2,000 people took part in our survey. Not only did it provide valuable information for free, but it was also referenced by a wide variety of publications such as the New York Times, the Wall Street Journal, LeMonde, FAZ and The Guardian. Surveys are often quite expensive... really expensive. We have eliminated these expenses by using our knowledge in market research to conduct the surveys on our own. We wanted to give people a free overview of the coworking economy, so they can focus on what's even more important things, such as communities and spaces. With our data, we have helped people write business plans for coworking spaces, and also for expansions. With our data, even a coworking health insurance plan was created in Canada. However, sometimes knowledge isn’t everything, it's also about the capacity. With each survey, we have received more data, and then have had to compare it with the previous studies, which doubles our workload each year. This year, we only could analyze the responses, but not all relations among them. With your support, we would like to make sure that we can analyze all results from the 3rd and upcoming 4th Global Coworking Survey. The results will still be published for free, processed in various articles. As a thank you, we will provide these results in handy booklets, one for the 4th Global Coworking Survey, and another containing ALL Global Coworking Surveys which will also include a factual comparison of the development of the coworking economy in the last four years. We also will process these results in a printed market report with more insights, explanations, recommendations and background information, which you can also choose as a reward. Each week, we receive dozens of emails about statistics and studies. Coworking spaces, both old and new, ask us to cover them in Deskmag stories. We also regularly receive many emails about events at coworking spaces which people would like to be covered on Deskmag. We're delighted by all of these emails, and appreciate them a lot. However, we can't publish everything within our current structure. It's leading us to work beyond our limits and we can no longer respond to every email. Even though it breaks our hearts leaving some of our readers without a response, we would also like to focus more on our core content. That's why we will open a part of Deskmag to serve both the needs of our readers, and our need to work more efficiently. 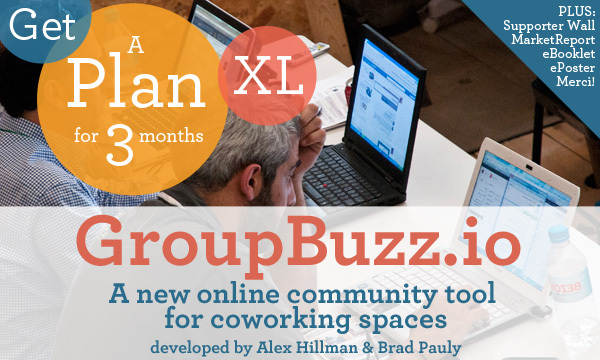 The new website will give readers the opportunity to foster coworking knowledge. Readers, spaces and associations can create and curate content, such as summaries of new studies, scientific theses, as well as their own articles in a special edition of Deskmag. 1) A free online coworking library: The new Deskmag platform will allow our readers to share the latest research, studies and documents related to coworking in a well-structured and easy-to-use archive. 2) An open platform: Readers can contribute their own articles, as well as curate and share content related to coworking and their own coworking space or association. 3) A coworking event calendar that will regularly show local and global coworking event dates connected to the website of these events. 4) We are often asked to cover new and more coworking spaces. To answer this need without changing the core of Deskmag, we will create a curated category, 'coworking creation'. It will become the base for a visual analysis tool and it will also give us the opportunity to improve our ability to count and keep track of coworking spaces worldwide. A summary of the development will be shared on Deskmag's website with the coworking community every six months. It will also give us a better chance to cover and identify different coworking spaces for our stories, which will widen cultural perspectives and allow us to share more experiences. 5) A job board for all employment opportunities found in coworking communities connected to their websites. 6) A new design: Our main focus is dedicated to the content. However, after more than three years, our website needs an upgrade to integrate these new tools and to respond to new reading behaviors. Again the main design won't be changed. We will keep it simple. If we can collect more than 20,000 Euro, we also will introduce an interactive analytic tool for surveys and an integrated graphic tool which will allow readers to make your own charts according to topic of interest. We already have enough content and data to create a comprehensive market report, which can't be reduced to a booklet. The printed edition will be a sleek issue featuring insights and trends taken from our own market research over the past years. It will also include knowledge of external studies, as well as new stories, interviews, and a selection of Deskmag's most popular articles for background information. It will allow Deskmag to spread the word on coworking and reach more people. It is also a way for coworking space operators, independently from their local work, to show that they are part of a bigger economy. 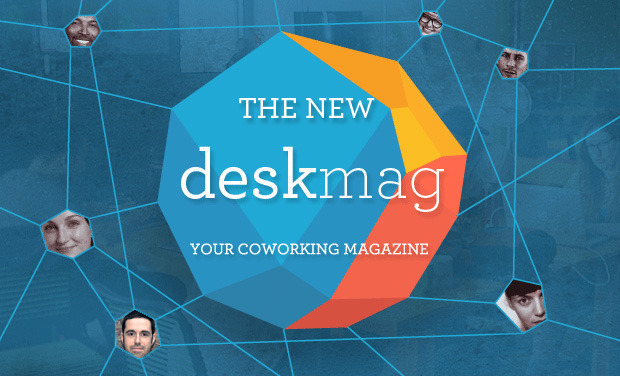 Deskmag is the online publication dedicated to coworking. We explore this new movement of collaborative work spaces, and its members, across the globe. For our readers, we give detailed insights on how coworking spaces have started, how they have grown, and how they can be be improved. We regularly provide tips and tools for those who are interested in working independently. At its core, Deskmag shows the ways in which people can benefit from coworking in many aspects of their lives and how to setup and improve coworking spaces according to the needs of their members. 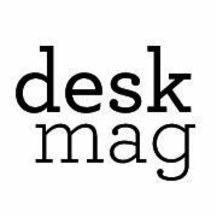 Over the course of the past four years, Deskmag has proven itself as a useful and authentic publication dedicated to the coworking movement. Only with your support will we be able to continue our work and to develop a more collaborative version of Deskmag with more stories, stats and analysis tools. In addition, we will also be able to pay our talented contributors to help us work towards our goals. 2. We will create a new website with an updated and easy-to-use interface. 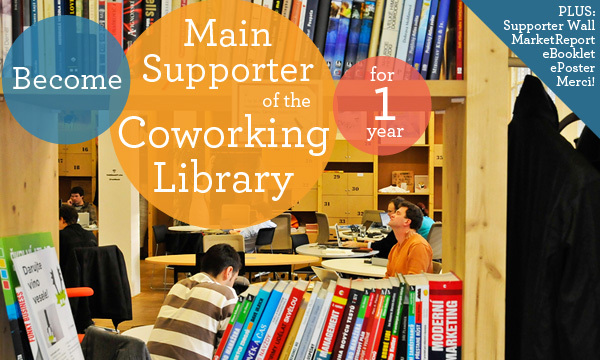 We will also include all of the aforementioned features, such as the coworking library, a more advanced tracking system for coworking spaces, and a reader’s edition of Deskmag = € 4.200. 4. We will cover the expenses of this campaign = € 1.500. For 15.000 Euro: We are able to publish more stories on coworking and can enhance our market research. Fresh stats are the most useful stats. For 20.000 Euro and more: We will introduce an interactive analysis tool of our market research. Readers will be able to create their own stats, tables and graphs. Every donation, no matter how small helps us in a very big way. Your €5 donation comes with a poster as a supersize PDF, a kiss kiss from our entire team and a thank you on our website. The poster can be printed in any size you want up to a maximum of A1 (EU), E (US). You can cover your entire coworking space with it, as well as print postcards with your own logo attached. PLUS: Your place on the supporter list on our website and a big merci! Be among the first to receive a digital booklet with the results of the upcoming 4th Global Coworking Survey. PLUS: your name on our supporter list (if wished) and the ePoster! 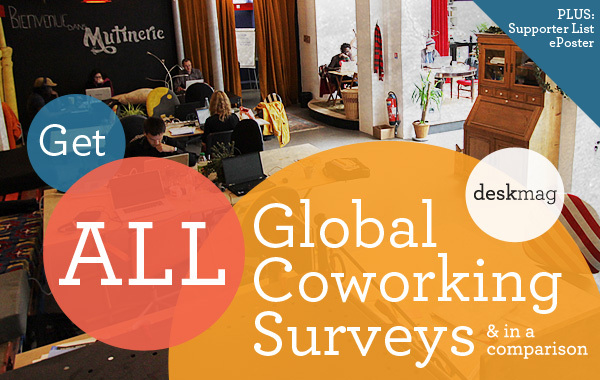 Receive a digital issue of the results of the Global Coworking Survey, from the 1st to the 4th, which will also include a COMPARISON of key facts taken from the annual results. PLUS: the ePoster, and your name in our list of supporters. 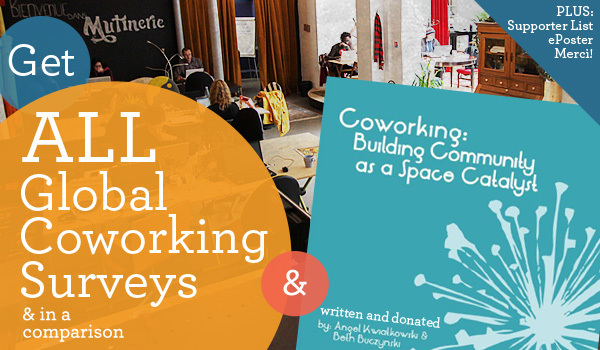 Get all results from the Global Coworking Survey (1st - 4th) and the classic eBook “Coworking: Building Community as a Space Catalyst” (2011) written by the coworking experts Angel Kwiatkowski (Cohere, USA) and Beth Buczynski (Author of "Sharing is good"). PLUS: Your name on our list of supporters on Deskmag and the ePoster. Feeling lost in the world of freelancing? 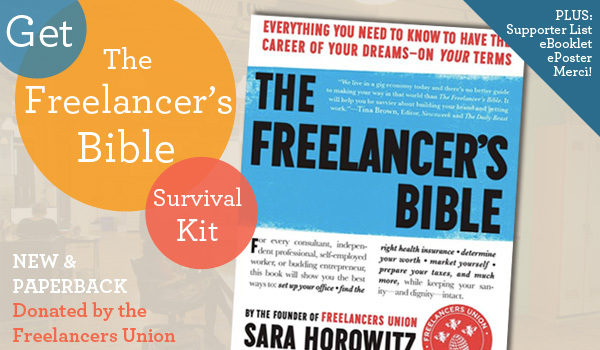 Get the Freelancer's Bible, written by the head of the Freelancers Union, Sara Horowitz. This book is a product of more than 15 years working with freelancers, hearing their stories, and learning from their successes. 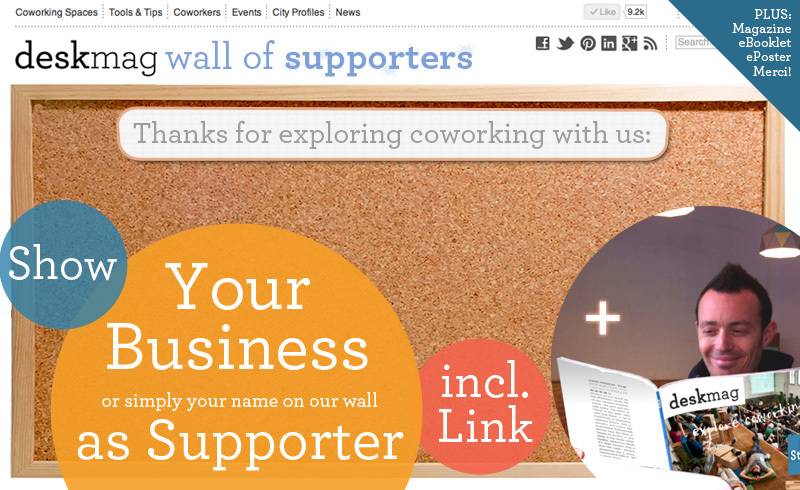 PLUS: Your name on our list of supporters on Deskmag, the eBooklet of all Global Coworking Surveys and the ePoster. Receive the limited edition of the first Coworking Market Report with more insights, in-depth results, key facts and all the stats from the Global Coworking Survey. These will include interviews, trends and stories as background information. Shipping is included. PLUS: Your name on our list of supporters on Deskmag, the eBooklet of all Global Coworking Surveys and the ePoster. Have your name (or your company's name) including a photo on Deskmag's official wall of supporters. This will also include a link to your website or your contact details. The supporters will be ranked by the height of their support. 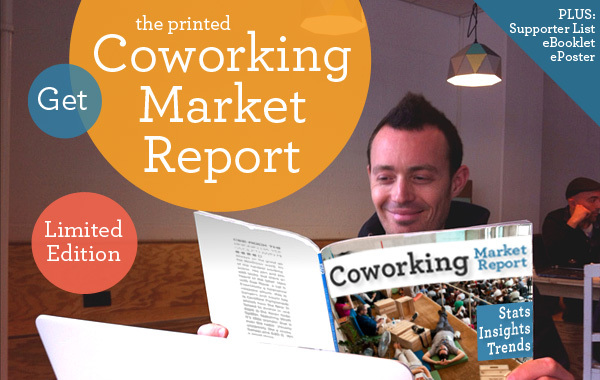 PLUS: The printed Coworking Market Report, the eBooklet of all Global Coworking Surveys and the ePoster. Have your name (or your company's name incl. 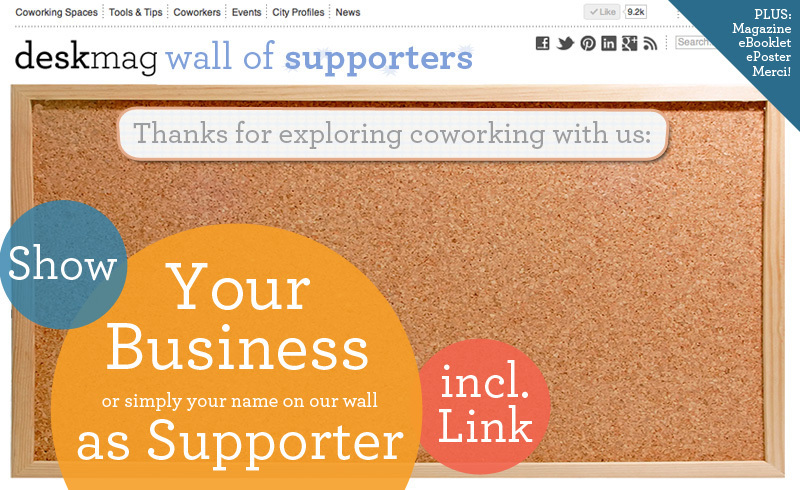 photo) shown as a supporter of our Coworking Market Report. PLUS: Your name, picture and link on our wall of supporters, the printed Coworking Market Report, the eBooklet of all Global Coworking Surveys and the ePoster. 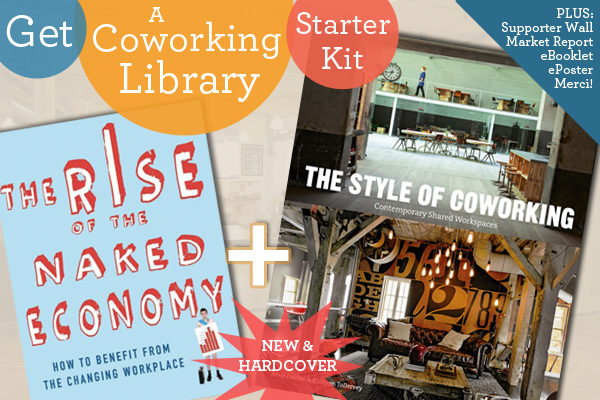 Start your own coworking library with these two new books about coworking! "The Rise Of The Naked Economy" shows readers how to achieve both personal and professional success in this new economy. 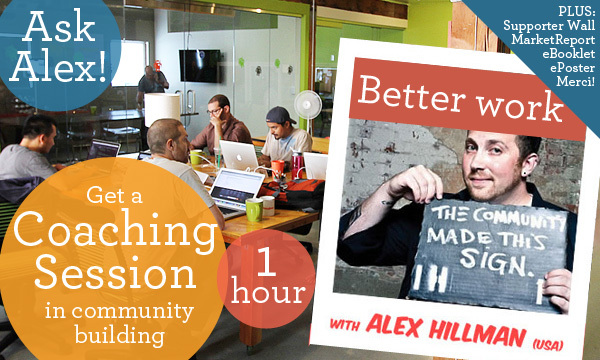 "The Style Of Coworking" leads you through coworking spaces worldwide. This book is perfect for you, entertaining guests and glamorizing your bookshelf. PLUS: Your name, picture and link on our wall of supporters, the printed Coworking Market Report, the eBooklet of all Global Coworking Surveys and the ePoster. Get Cobot for six months (=50€/month) that can help organize up to 135 members. This plan is ideal for extra large coworking spaces. PLUS: Your name, picture and link on our wall of supporters, the printed Coworking Market Report, the eBooklet of all Global Coworking Surveys and the ePoster. 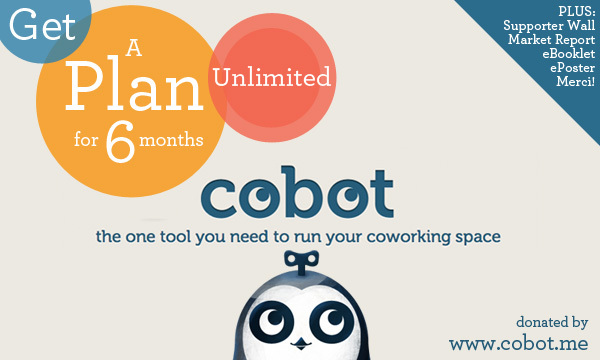 Cobot is the leading management software for coworking spaces. They use this software to run their business around. Get a plan for this software for SIX MONTHS and organize an UNLIMITED number of members. This plan is a very good deal for huge coworking spaces. PLUS: Your name, picture and link on our wall of supporters, the printed Coworking Market Report (limited and signed by the Deskmag team), the eBooklet of all Global Coworking Surveys and the ePoster. Get your ad next to all category pages for Deskmag's articles for a year (size: 300 x 350 px) PLUS: Your name, picture and link on our wall of supporters, the printed Coworking Market Report (limited and signed by the Deskmag team), the eBooklet of all Global Coworking Surveys and the ePoster. 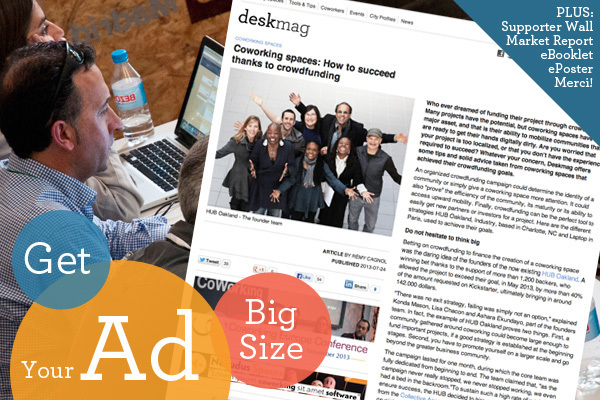 Get your ad next to all articles of Deskmag's website for three months (size: 468 x150 px) PLUS: Your name, picture and link on our wall of supporters, the printed Coworking Market Report (limited and signed by the Deskmag team), the eBooklet of all Global Coworking Surveys and the ePoster. Cobot helps you manage your coworking space. Tired of book-keeping? Get this software for six months (=21€/month) that can help organize up to 35 members. This plan is ideal for new and small coworking spaces. PLUS: Your (company's) name, picture and link on our wall of supporters, the eBooklet of all Global Coworking Surveys and the ePoster. 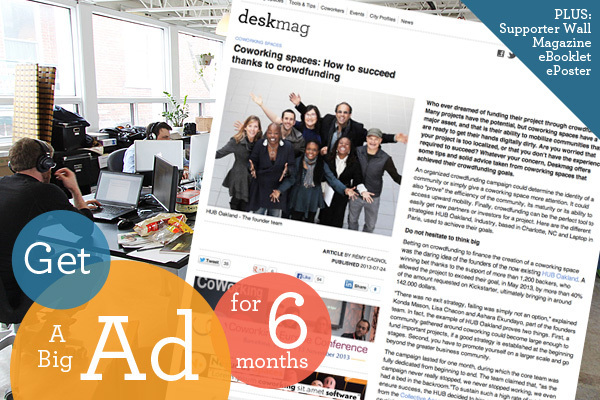 Get your ad next to all articles of Deskmag's website. Available for one month (size: 468 x150 px). PLUS: Your name, picture and link on our wall of supporters, the printed Coworking Market Report, the eBooklet of all Global Coworking Surveys and the ePoster. You will receive the first ticket for all three days at the Global Coworking Unconference Conference 2014, or simply, “GCUC”. 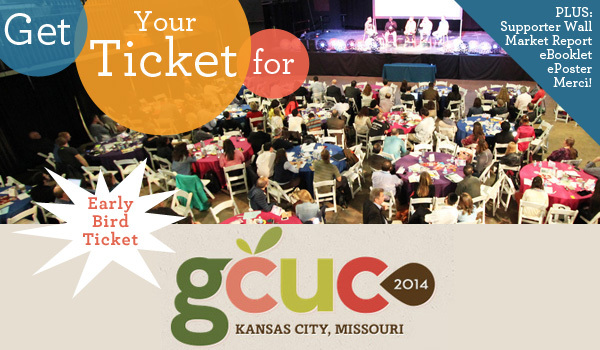 America's biggest coworking event will take place in Kansas City in May 2014 (Ticket sales start in December). PLUS: Your name, picture and link on our wall of supporters, the printed Coworking Market Report, the eBooklet of all Global Coworking Surveys and the ePoster. Get a ticket for the next European Coworking Conference in Barcelona on November 11-13th, 2013, Europe's biggest coworking event. You will receive this ticket right after backing this project, even before the campaign ends! PLUS: Your name, picture and link on our wall of supporters, the printed Coworking Market Report, the eBooklet of all Global Coworking Surveys and the ePoster. You can place your ad next to all articles (468 x 150px) at Deskmag for six months as well as on one page in the printed magazine (full page: 8½ × 11"). Furthermore, you will be shown on our supporters section at the bottom of any page of Deskmag's website. PLUS: Your name, picture and link on our wall of supporters, the printed Coworking Market Report (limited and signed by the Deskmag team), the eBooklet of all Global Coworking Surveys and the ePoster. To have a bigger ad or be present on the all languages version, please contact us: remy@deskmag.com.